Clean up after the holidays are a snap with the Ultimate Red Christmas Wreath Bag from the Elf Stor. A must have after the holiday season, an Elf Stor Christmas wreath bag will store your wreath away neatly, effortlessly, and make for quick setup next year. It's as easy as placing your artificial Christmas wreath in the bag, securing it with the internal strap and buckle support and zip it up and safely store it away until next year. Identify it in a snap next season with the clear window across the middle of the bag. Have lights or bulbs? They store easily within the internal storage pouch. This keeps everything together and eliminates the frustration of finding them next season. Because our bag is a full 24 inches long, 24 inches wide, and 7 inches deep, you will have no problem storing artificial wreaths up to 24" in diameter. 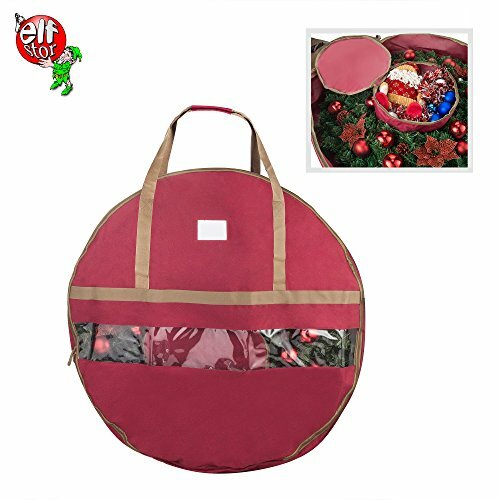 The Ultimate Red Christmas Wreath Bag from the Elf Stor has sturdy carry handles for easy transport. No assembly required, just unpack, unfold, and insert your wreath. ►Dimensions 48" x 48" x 10"